In important respects Australia is an exception to the forces said to be weighing on growth prospects in other advanced economies. Australia’s most exceptional exception to the global gloom is the projected rapid rate of growth of its workforce over the next 30 years. Though global growth will almost certainly slow in coming decades, Australian living standards can rise faster than those of the United States or most other advanced economies. Realising Australia’s strengths depends on attention to workforce participation, to services sector productivity, and above all to sustaining political consent to a big immigration program. Australia is gliding into its 26th year of uninterrupted economic expansion at the same time that the United States and the United Kingdom are wrestling with political rebellions against the very forces that have stoked Australia’s long boom. Open trade, high migration, and unimpeded economic globalisation are under political challenge in major advanced economies. In those same economies, respected economists are predicting a gloomier future. Former US Treasury Secretary Lawrence Summers has declared ours to be an “Age of Secular Stagnation”. US economist Robert Gordon says the best is over for the US economy and others like it. This Analysis finds that Australia is an exception to unfavourable trends said to be evident in other advanced economies. There is no evidence of secular stagnation in the Australian economy — and not much evidence of it in the US economy either. Australia exhibits very few of the ‘headwinds’ to growth Gordon cites for the United States. There is no doubt global output growth is slowing, however, largely because of slowing population growth, ageing of the population, and the inevitable decline in emerging economy productivity growth as they catch up to advanced economies. Even so, Australia can remain strikingly exceptional, underpinned by markedly stronger workforce growth over the next 35 years than is now likely in the United States (or China, Europe or Japan, all of which will have shrinking workforces). Australia cannot control what happens in the rest of the world, but with sensible policies to enhance the value of its human capital Australian living standards can grow a little faster than those of the United States, Europe, or Japan over coming decades. Those sensible policies will, however, become harder to sustain as global competition for skilled migrants increases, as the political cost of measures to increase workforce participation rise, and as bigger disparities in Australian household wealth become increasingly apparent in similarly widening disparities in Australian incomes and life opportunities. As the Australian economy enters its 26th year of uninterrupted expansion, much of the rest of the world ponders a gloomy future of intractably slow growth and economic hazard. In both the United Kingdom and the United States economic disappointment has sparked political rebellions against trade, migration, and economic globalisation, policies important to Australia’s success. Global output growth has slowed over the past five years, as has the growth of world trade and industrial production. For most of the past five years the International Monetary Fund (IMF) has expected growth to strengthen, and in most years it has been disappointed. In advanced economies the slowdown has been so persistent it has given rise to a new economic literature to explain it. Former US Treasury Secretary Lawrence Summers warns of a stubborn “Age of Secular Stagnation” beyond the reach of even the most drastic central bank remedies. US economist Robert Gordon looks further into the future, arguing the slowdown today is just the beginning of a prolonged deterioration that will continue for decades. In a recent report the Asian Development Bank declared that Asia faces the same slowdown and the same limits to growth as are now forecast for the advanced economies. These are only some of the items on a lengthening list of global economic woes. It is frequently reported that China is on the brink of financial crisis. A recent report by Deutsche Bank predicts 35 years of low world growth. Following French economist Thomas Piketty’s diagnosis of widening inequality as profits implacably grow faster than wages, Branko Milanovic argues that rising inequality threatens the entire existing order of global trade, investment, and migration. His concerns appear to have been validated by Brexit and the election of Donald Trump, two political rebellions of the losers against the winners from three decades of accelerating economic globalisation. With output growth not far below the average of recent years, the Australian economy appears to be a weird exception in the global gloom. Despite a sharp fall in mining investment, slumping commodity prices, and a slowdown in Australia’s biggest export markets, the Australian economy continues to do quite well. But if these are indeed harsh times, if the global economy is indeed deteriorating, if the rest of the world really is entering an indefinitely prolonged economic slowdown attended with political rebellions of the have-nots, how can Australia be unaffected? Australia has an open economy, so what happens elsewhere in the world will sooner or later be reflected in trade, capital flows, and migration here. The structure of the Australian economy is similar to other advanced economies, so what is happening in their economies might also be happening or about to happen here. With this prospect in mind, this Analysis inspects this flood tide of daunting prophecies. It ponders their plausibility, how Australia might fare in the future they depict, and how Australia should respond to the risks they present. According to Summers, the United States and other advanced economies are caught in a trap. Households and businesses are fearful and hesitant, with households trying to save more and businesses wishing to invest less. The result is that savings and investment, which are always equal, reach equality at a level of output below that necessary to provide full employment. Evoking a 1939 paper by US economist Alvin Hansen, Summers calls this ‘secular stagnation’. The usual solution to this problem would be for central banks to lower interest rates to discourage saving and encourage investment. But because inflation is so low, Summers argues, real or after-inflation interest rates remain above the level required to equalise saving and investment at full employment. To further stimulate investment, central banks would need to set policy rates well below zero, which would create many awkward problems. Instead, Summers urges spending on infrastructure to raise investment and output. Already troubled by deficits and high debt, governments have been reluctant to take Summers’ advice. Summers’ story is plausible, forcefully argued, and well grounded in standard theory. If he is right, the world has a big problem and Australia will sooner or later share it. The Australian economy is at first glance a good candidate for secular stagnation. Investment has fallen sharply as a share of GDP. Total business investment peaked at 18 per cent of GDP in 2012 and by 2015 was down to 14 per cent of GDP. Compared with a decade ago national savings has increased as a share of GDP. However, more than half of the decline in investment was in mining and mining-related investment. It has not fallen because interest rates are too high or demand too low, but because a large number of projects were commenced around the same time and finished around the same time. Although business investment is down, there is otherwise no evidence of stagnation in Australia. Employment growth has been quite firm over the past few years. Helped along by stronger exports, home construction, and household consumption, output growth is running around its average rate of the past few decades. Similarly, there is no evidence that monetary policy in Australia is ineffective, or likely to become so soon. Since 2011 the policy rate has fallen 325 basis points. This is more than three times the decline in core inflation, so the real interest rate has fallen markedly. The decline in interest rates has been associated with a strong upswing in residential construction, a lower and more competitive Australian dollar, much higher exports (including services), as well as rising prices for bonds, shares, and property. At around 1.5 per cent, Australian core inflation is low but very far from negative. While interest rates may be near rock bottom in the United States, Europe, the United Kingdom, and Japan, the Australian overnight rate is, at 1.5 per cent, still well above zero. It has not been necessary for the Reserve Bank to seriously consider negative interest rates, major bond purchases to drive down the long-term interest rate, major purchases of bank securities such as packaged mortgages to directly drive down bank funding costs and increase liquidity, or intervention in foreign exchange markets to directly drive down the Australian dollar. All those tools could be used if required. For all its celebrity, it is not entirely clear that Summers’ thesis explains what is happening in the US economy either. For one, the US economy is not stagnant, though that is not the real weakness in the story. If Summers is right, not only would we expect to see markedly lower GDP growth in the United States, but also lower investment and higher savings. Yet business investment in the United States as a share of GDP is quite close to where it was earlier in the decade, and savings as a share of GDP has been on average a little below where it was earlier. GDP growth over the past five years has averaged a bit less than the average over the seven years before the Great Recession, but not much less. It is true US productivity growth or the growth of output per hour worked is well down. But the secular stagnation thesis is not intended to explain the productivity slowdown — though the productivity slowdown explains most of the slowdown in US output growth. Summers argues that the United States is making a relatively weak recovery from the recession of 2008 and 2009, compared with past recoveries. That is certainly true. On the other hand, the upswing is now in its seventh year and shows few signs of ending. It is not far short of a record for an uninterrupted expansion. Comparing only the amplitude of upswings gives insufficient weight to their duration. Whatever problems Australia might be encountering, secular stagnation is not one of them. Nor is it convincingly evident in the United States. But what of the future? Is growth in the world’s biggest advanced economy likely to decline over coming decades? And if so, does Australia present the same symptoms? This brings us to US economist Robert Gordon’s work. Gordon argues that the best is well and truly over for the US economy and that over the coming decades growth will be slower. The most notable of his claims is that the true transformative technologies were those of the past — electricity, sewerage, railways, cars, aviation, telephones. It is hard to identify anything recent or likely to emerge that can or will match them for productivity gains. He argues that increased computing power, cheaper telecommunications, and mobile devices will continue to be useful but have not and will not permit productivity increases of the magnitude of earlier technologies. That argument is not the only reason Gordon thinks the best is over — and not the most important reason. He identifies other ‘headwinds’ that will slow the growth of output and living standards in the United States and economies like it. He cites the ageing of the American population, the cresting of the contribution to productivity made by increasing education over the past century, the increasing share of services in advanced country output, global warming, budget deficits and government debt, and increasing inequality of incomes and wealth. Putting aside the demographic issue, Gordon’s first headwind to growth in the United States is human capital, or the skills of the workforce. He argues the big contribution to US productivity growth from increasing levels of education and training in the US workforce is now peaking. Australia has a sufficiently similar economy and education system to the United States to suggest what may be true for human capital in the United States might also be true for human capital in Australia. One way to examine this in Australia is to contrast the Australian Bureau of Statistics (ABS) measures of hours worked and ‘quality adjusted’ hours worked. The latter adjusts the number of hours worked by changes in the quality of hours worked. If new entrants to the workforce are better educated on average than the existing members of the workforce, the quality of hours worked increases. The extent to which the rate of growth of quality adjusted hours worked exceeds the unadjusted rate is a measure of the rising average quality of the workforce — or, at least, an ABS measure of that difference. The measure takes into account the rising education level of new entrants, the changing levels of training and retraining of employees, and the extent to which experienced workers are retiring. The ABS data shows that in the five years to 2014/15 the growth of adjusted hours over unadjusted hours was a touch below the five-year record reached in 2010/11 and otherwise faster than in any five-year period from the beginning of the series in 1994/95. On this ABS measure, over the past 20 years the quality of the workforce has continued to increase, driven by increasing levels of education, training, and experience. We also know the proportion of new entrants to the workforce with university education is still rising in Australia, and is still below the US rate. In May 2015 the ABS reported that the proportion of working-age women with a degree had increased fourfold over the past 15 years, while the proportion of working-age men with degrees had more than doubled. Looking at Certificate 3 vocational qualifications through to doctorates, the proportion of workforce-aged Australians with formal educational qualifications has increased from 47 per cent to 60 per cent in the past five years. With the sharp increase in the proportion of young people in higher education in recent years, the improvement in workforce quality should continue for some time. To the extent it is actually funded, the needs-based school support program that came out of the Gonski Review of Funding for Schooling should drive up the average quality of school leavers. There are also major gains possible in vocational education and in preschool education. So regardless of whether productivity gains from increasing education are peaking in the United States, they still have quite a way to go in Australia. Gordon’s second headwind to growth in the United States is that labour productivity gains are slower in the services sector than in manufacturing. Since most employees in the United States are in services and most output is accounted for by services, and since the services sector is expected to continue growing faster than manufacturing, productivity growth over the economy as a whole is likely to decline. If that is a problem in the United States it might well be a problem in Australia, which has an even bigger services sector employing an even bigger share of the workforce. Regardless of whether that is true of the United States, it has not been true of Australia. Compared with productivity growth overall, productivity gains in services in Australia have been quite big. In the 20 years from 1994/95 to 2014/15 the average annual rate of productivity growth across industries where the ABS is confident it can be measured was 1.8 per cent. In wholesale trade over the same period the average annual rate of growth of labour productivity was 4 per cent; in information, media, and telecommunications also 4 per cent; in finance 3.7 per cent; in retail 2.7 per cent; in transport 1.8 per cent. It was lower in professional and technical services (1 per cent) and in rental, hiring, and real estate (0.8 per cent). However, in all these service industries productivity increased on average and has increased in the five years to the latest data point, 2014/15. Over the same period labour productivity in agriculture has grown much faster, at an annual average rate of 5.3 per cent. But the annual average gain in manufacturing was only 1.9 per cent — around the average of the economy as a whole, and well below the gains in retail, wholesale, information and telecommunications and media, and finance. Over those years labour productivity in mining and in electricity, gas, and water actually fell. Productivity growth overall could be dragged down if low productivity service industries expanded while high productivity manufacturing and mining contracted. But many service industries have high levels of productivity. Using Australian Department of Employment calculations, in 2016 an hour’s work in manufacturing produced $58 (in 2013/14 dollars) in added value. In media and telecommunications an hour’s work added $139 in value; in wholesale trade $94; finance and insurance $186; in rental hiring and real estate services $127; and in transport $62. Some services have lower productivity levels than manufacturing. However, in general, manufacturing productivity in Australia is not so high or services sector productivity so low that a continuing decline in the share of manufacturing and a continuing increase in the share of services will necessarily reduce the level of productivity overall. There are good reasons to think service sector productivity gains can continue. More computing power, better software, and more market disciplines in areas such as health and education will likely continue to improve output per hour worked in services. Services trade is at the heart of most recent regional trade agreements, opening up larger markets for Australian commercial services as well as education and tourism. Increasing demand for services permits economies of scale. Increasing levels of education and rising skill levels should also benefit the services sector since it is labour intensive. Of the headwinds to the growth of US output and incomes Gordon detects, those concerning the contribution of education and training to productivity, and services sector productivity, do not apply in Australia. This leaves three big issues to consider. One is stagnation of incomes from higher taxes and rising inequality. The other two are Gordon’s prediction of a slower rate of technological innovation compared with the past, and the headwind of ageing and slower population growth. Gordon argues that not only will US output growth be slower, but household disposable incomes for most Americans will increase by even less than the rate of growth of output. One headwind to income growth he identifies is size of government debt and deficits. Another is the increasing inequality of incomes in the United States. With US debt at an all-time high, interest payments on government debt will inevitably mean higher taxes and or reduced benefit payments over the next 20 years compared with the past 20 years. This will be true of Australia also, but to a much smaller degree. Australian government debt to GDP (including states, and net of financial assets) will reach 20 per cent of GDP in 2018/19. In the United States it is already a little over 80 per cent of GDP. If government debt in both economies stabilised around this share of GDP and the interest rate on long-term debt was the same in both economies, the tax required to pay the interest on that debt would be four times higher as a share of GDP in the United States than Australia. At a 3 per cent interest rate for example it would be 0.6 per cent of GDP in Australia, and 2.4 per cent in the United States. And if Australia does indeed bring the budget back into balance in four or five years and then keeps it in balance, the interest payment will gradually decline as a share of GDP. Gordon’s concerns about inequality are shared by Branko Milanovic. In Global Inequality: A New Approach for the Age of Globalization, Milanovic convincingly documents sharply increasing income inequality in advanced economies since the 1980s, although income inequality has declined across the world as a whole. The median income for Americans is now only a little above where it was 20 years ago. If globalisation is one of the causes, as Milanovic argues, it clearly has not benefited lower-income Americans. And if Gordon is right and US incomes and productivity will increase much more slowly over the next 20 years than the last half-century or so, then on today’s pattern of distribution those in the middle and below may see their living standards continue to decline. Milanovic argues rising inequality in the United States has been caused by the decline of manufacturing, the concurrent increase in cheap manufactured imports from low labour cost economies such as China, declining trade union membership, the rise of the finance sector and other well-paid service sectors, and waves of labour migration to the United States. In most of these respects Australia is not in the least exceptional. It has gone in exactly the same direction as the United States. Over the past 20 years Australia switched from compulsory arbitration to a wage bargaining system, goods imports rose from 30 per cent of domestic sales to 40 per cent, net migration to Australia exceeded three million or about one-eighth of Australia’s population today, cross-border capital flows vastly increased, the full effect of tariff cuts in 1988 and 1991 was felt across Australian manufacturing, more government businesses including Telstra were privatised, the reforms introduced by the National Competition Policy Review (the Hilmer Review) increased competition in government services, and in many other areas market forces were given free play. The finance sector boomed. Between 1994/95 and 2014/15 the manufacturing workforce declined from 14 per cent of total employment to 8 per cent. Over the same period, total employment in services increased from 72 per cent of the workforce to 77 per cent. The profit share of national factor income increased a little, while the wages share fell a little. In 1994, just over one-quarter of private sector employees were trade union members. Nineteen years later the proportion had plummeted to one in twelve. Almost everything that Milanovic cites as the causes of the big increase in US inequality and the decline of median incomes also happened in Australia, and at much the same time. Yet the results in America are not replicated in Australia. Both Gordon and Milanovic point to decline or stagnation in median American incomes over decades. On the latest US data the median income after inflation rose by 5.5 per cent in 2015, the best result in many years. Even so, the US median income was still below the level reached in 1999. Far from falling over the period, median and lower incomes in Australia have strongly increased. According to the ABS Household Income and Wealth data, in the 19 years from 1994/95 to 2013/14 the disposable incomes of the lowest fifth (or quintile) of households increased after inflation by 58 per cent. The average incomes of households in the third quintile increased by much the same. The income of the highest quintile of households increased by 80 per cent. While the highest quintile gained the most by a considerable margin, all the other quintiles also saw considerable real gains. Remarkably, there was not much change in household disposable income shares. In 1994/95 the lowest quintile accounted for 7.9 per cent of all household income. By 2013/14 that had fallen, but only to 7.5 per cent. The highest quintile gained, from 37.8 per cent of all household income in 1994/95 to 40.8 per cent. In 1994/95 household income at the top of the ninetieth percentile was 3.8 times the lowest percentile, and in 2013/14 it was four times the lowest. Australia’s income distribution has become more unequal. A summary measure is the Gini coefficient, where a value of one means that all income goes to one household and a value of zero means each household has the same income. On ABS figuring the Gini coefficient for household disposable incomes in Australia was 0.302 in 1994/95. By 2013/14 the Gini coefficient was 0.333, a significant deterioration. Even so, on comparable data the deterioration has been far sharper in the United States. On OECD calculations and using for comparability the income definitions standard until 2011, the Australian Gini for disposable income moved from 0.315 in 2004 to 0.324 in 2012, a change of .009. In the same period the US Gini for disposable income moved from 0.360 to 0.389, a change of 0.029, or more than twice as much expressed as a percentage change. After 20 years of relentless economic restructuring in Australia, the increase in disposable income inequality is not as big as we might have expected. There are warning signs in the deterioration that has occurred, however, and further deterioration is already baked in. Since wealth is far more unevenly distributed than income and there have been big gains in household wealth, it is highly likely that the wealth distribution has become far more unequal. Sooner or later those increased disparities in wealth will become more apparent in widening disparities in income and in the life opportunities provided by housing amenity, education, and health. But so far, the lowest income fifth has seen big increases in disposable income, and the gains at the top have not been as lavish as those for the United States or the United Kingdom. Gordon’s most widely known contribution to the literature is his argument that the growth of productivity or output per hour worked will not be as good in future as it was in the past. He claims the technologies which added immensely to wealth over the past hundred years, such as electricity, motor vehicles, aviation and indoor plumbing, are unlikely to be matched in the coming fifty or hundred years. Querying predictions of a new wave of productivity arising from technological innovations such as machine learning and digital disruption, he points out that US productivity growth has been declining in recent years — despite much cheaper and vastly more powerful computing technologies. In a certain sense Gordon’s argument has already proved true, and for Australia as well as the United States. 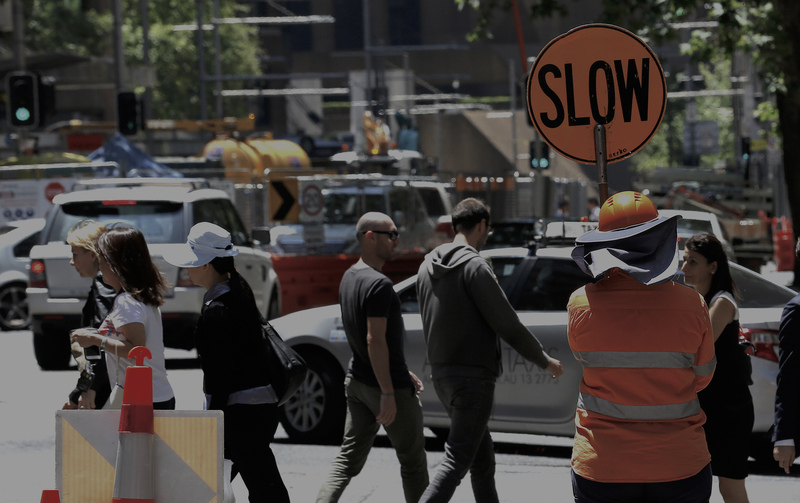 Australia’s economic growth, the growth of its living standards, of productivity, have already slowed — and far more dramatically than the likely slowing we might expect in coming decades. In the celebrated upswing of the past 25 years, Australia’s GDP has increased by 123 per cent. Measured as GDP per head, Australian living standards have increased by 61 per cent — not much less than two-thirds. It is a remarkable record. But it is easily exceeded in the quarter century following the end of the Second World War, roughly the period Gordon refers to as the peak period for technical innovation and productivity growth. In the 25 years from 1946 to 1971 Australian GDP increased by 230 per cent, just short of twice the gain of the past 25 years. Real income per person increased 157 per cent, well over twice the gain of the past 25 years. It is difficult to find a good estimate for labour productivity gains in the 25 years from 1947 to 1972, but it is possible to get a rough idea by comparing the growth of real output with the growth of employment. Output rose 230 per cent over the period, and employment 78 per cent, for a roughly estimated productivity gain of 152 per cent. Productivity growth over the upswing of the past 25 years has been solid, but at 54 per cent it has not been a patch on the earlier gain. It is not that far in front of the 49 per cent gain from 1972 to 1991, the unhappiest of our post-war economic experiences. Before moving on to the wider issue of future global growth, we should examine another dire prediction, this time of a crisis so severe that any further discussion of global growth prospects would be for a long while unnecessary. According to many commentators, chief among today’s risks is China’s debt. A financial crisis in China caused by bank losses and depositor panic would have an immediate impact on Australia through the collapse of metals prices, the Australian dollar, and share prices of major exporters of commodities to China. So how likely is such a crisis? According to the Institute of International Finance, China’s total debt has reached 280 per cent of GDP. Of course, not all that debt is actually at risk. China has huge savings, some of which it exports to the rest of the world through its current account surplus. Only in recent years has it begun to liberalise management of capital flows with other countries. A consequence is that almost all of China’s debt is owed within China and priced in Chinese yuan. Moody’s ratings agency finds that of the debt of 280 per cent of GDP, about 40 per cent of GDP is central government debt. Another 40 per cent of GDP is household debt — still quite low by comparison with other countries. In Moody’s view, neither of these borrowing sectors present significant aggregate default risks. Nor is there substantial aggregate risk to debt held by privately owned businesses, which in recent years have increased their assets markedly faster than they have increased debt. The debt of state-owned enterprises (SOEs) does present risks. Moody’s estimates that SOE debt is 115 per cent of GDP. Most of this debt is owed to China’s state-owned banks. Not all of it or even most of it is at risk of default. Moody’s calculates that the cost of reducing the debt of the most egregiously over-borrowed SOEs to the median leverage of SOEs would be 25 per cent of GDP. Were China’s government to assume all that debt, it would take Chinese government debt to 65 per cent of GDP. This would still be well below the United States (80 per cent of GDP) and much of Europe. Moody’s numbers are conservative. The IMF estimates that corporate debt equivalent to 15.5 per cent of GDP is ‘potentially at risk’, with potential losses of around 7 per cent of GDP. Australia may not share many of the problems Gordon and others say will impede US output growth. But as a trading nation, Australia is not protected from the broader trend of slower global growth. There is no doubt global output growth has slowed, though mostly not due to impediments identified by Summers or Gordon. In the three years prior to the 2008 Great Recession in the United States and Europe global output growth averaged 5.3 per cent. In the three years beginning 2010 annual global growth averaged 4.3 per cent, and in the three succeeding years (2013–2015) 3.3 per cent. Comparing the years before the Great Recession with the most recent years, global output growth has fallen by over a third. But much of the slowdown has been in the emerging or less developed economies such as China rather than the advanced economies such as the United States. Comparing the three years 2005–2007 with the three years 2013–2015, the advanced economies slowed from a weighted annual average GDP growth of 2.9 per cent to a weighted annual average of 1.6 per cent, a total slowdown of 1.3 percentage points. Over the same two periods the emerging economies slowed from a weighted annual average of 8 per cent to 4.5 per cent, a slowdown of 3.5 percentage points, or more than twice the deceleration in the advanced economies. Using purchasing power parity weights, the advanced economies accounted for 42.5 per cent of global output in 2015, and the emerging economies for the remainder. So the emerging economies slowed more than twice as much as the advanced economies, and have more weight in the global economy. Of the change in global output growth, comparing the three years 2005–2007 with the three years 2013–2015 the emerging economies accounted for roughly three-quarters of the decline. The slowdown in China, for example, is much bigger and more important for global growth than the slowdown in the United States. In constant prices, US output growth slowed from an annual average of 2.6 per cent in the three years 2005–2007 to 2.1 per cent in the three years 2013–2015, a decline of 0.5 percentage points. By contrast, comparing the same periods, China’s growth slowed from 12.7 per cent to 7.3 per cent, a slowdown of 5.4 percentage points. The two economies were roughly the same size over the period, so the slowdown in China’s economy contributed much more to the global slowdown than did the US. Despite the torrent of gloomy prognoses of the advanced economies, slowing global growth is predominantly not about the problems of advanced economies at all. Whatever their relevance to the United States or Europe, the arguments made by Summers and Gordon are not explanations about what is happening to global growth, which is what matters most for Australian exports. The slowdown is mostly about the emerging economies. And since it is so big, the China slowdown is the most important single part of the emerging economy slowdown. The slowdown in China, it should be noted, is exactly what the IMF, the World Bank, the Organisation for Economic Co-operation and Development (OECD) and for that matter policymakers in the United States and Australia, and of course in China, both expected and sought. Economic policy officials the world over argued China’s investment and credit-based growth model was not sustainable. It should rebalance away from investment, away from industrial production growth, and towards consumption and services production. Inevitably, it was said, China’s growth would slow — but to a more sustainable pace. Much of this is what has actually happened. There are certainly other influences contributing to the slowdown. Brazil, Russia, South Africa, and Canada, for example, have been knocked by lower commodity prices and other troubles. But a large part of the global growth slowdown is intended and desirable. Output growth is the sum of the growth of output per worker (labour productivity) and the growth of the number of workers. In the advanced economies productivity growth has slowed in recent years. Whether that slowdown continues or not depends on the pace of technological innovation, the rate of growth of capital equipment, and on advances in education and training. Technological advances have proved very hard to predict. Gordon argues that there is less promise in new computer and software technologies than is commonly supposed, and he may be right. We do not know. Gordon himself sensibly assumes labour productivity in the United States will grow at the average rate of the recent past, which has been less than spectacular. In the emerging economies, productivity growth has different drivers. Since they have a long way to go to catch up to the productivity levels of the United States and other advanced economies, productivity growth in the emerging economies is not limited to the rate of technological advances in the developed economies. In Asia, in particular, productivity growth has been much faster. Subsistence farmers move to city manufacturing or construction jobs, manufacturers deploy more capital on more advanced machinery, transport and communications improve by leaps and bounds and education levels rise. That is why China has been able to grow three or four times faster than the United States, although the number of workers in China is falling. But the catch-up will sooner or later fade. In their time, Japan, Taiwan, Korea, and Singapore all enjoyed periods of very rapid catch-up productivity growth. As the gap narrows, their productivity growth has drifted back towards the productivity growth of other advanced economies. This will almost certainly prove true of China, Indonesia, India, Brazil, and other catch-up economies, though they still have a long way to run with big productivity gains. Over coming decades global productivity growth is therefore likely to decline towards the advanced economy rate. At the same time, demography will also be dragging on global output growth. Unlike the productivity frontier, demographic change is predictable. As national income rises the number of children born to a couple falls. At the same time, better healthcare prolongs lives. Both are good developments, although together they mean population growth falls, populations get older, and as they get older the proportion of working-age people in the total population falls. Over the past ten years the workforce in Europe has shrunk by 1 per cent. The workforce in China over the same period has shrunk by 2 per cent. Between 2005 and 2015 the working-age population in Japan declined by an astonishing 11 per cent. Most major advanced economies will see declining population growth over the next 40 years, and many will see actual population declines. Because of this slowdown in world population growth, and more particularly the slowdown in the growth of the working-age population, world output growth will continue to slow. Only faster productivity growth can offset this, and faster global productivity growth is unlikely in the long term. The slowdown will be mitigated by the increasing weight of faster-growing developing economies in world output, but it is a safe bet the underlying trend will persist. This combination of slowing productivity and population growth is now commonplace in global projections. In its 2014 study Shifting Gear: Policy Challenges for the Next 50 years, the OECD, for example, projected slower global growth over the next 30 years because of population ageing and the “gradual deceleration” of the period of rapid growth in emerging economies. In a 2016 study the Asian Development Bank argued slowing population growth will continue to clip Asia’s economic growth over coming decades. Because of the increasing weight of the faster-growing emerging economies in global output, the global slowdown is likely to be mild, though prolonged. In this projected slowdown there is nothing astonishing. Led by the developing economies, global output in recent decades has increased at a rate and volume never experienced in human history. Even with the expected slowdown there will continue to be vast gains in living standards. So what does the global slowdown in workforce, productivity, and output growth mean for Australia? We have seen that Australia is an exception to many of the problems now encountered in other advanced economies. Its income distribution is less unequal than most other advanced economies. Among other advantages that enables Australia to sustain a relatively larger program of inward migration than either the United States or the United Kingdom, without the attendant political rebellion. It has demonstrated reasonable services sector productivity growth, and a rising contribution to human capital from education and training. Australia’s most exceptional exception, however, is its demography. Australia has a major demographic advantage over almost all other advanced economies and many developing ones. Its population is growing faster than many others, it is younger than others, and while the population is ageing it is not ageing as fast as many other advanced economies. In the five years to 2010 Australia’s population increased on average by 1.8 per cent a year, markedly faster than India or Indonesia (both 1.4 per cent). It grew faster than Canada’s population, twice as fast as that of the United States, and three times faster than the populations of China or the United Kingdom. These were years of unusually rapid population growth even by Australia’s standards in recent decades. However, at an annual average growth of 1.4 per cent over the past 40 years, Australia’s population growth has been faster than most developed nations, and faster than quite a few developing nations. For output growth the most important aspect of demography is the growth of the workforce-aged population rather than the population as a whole. In respect of workforce growth, Australia’s singularity is even more striking. The United Nations projects the population aged 15 to 59 will shrink by one-third in China between now and 2050. It will continue to decline in Europe (especially in Germany) and Japan. In the United Kingdom it will increase by 4 per cent. In Canada, an immigrant nation like Australia, it will increase by 5 per cent. In the United States it will increase by 9 per cent, a considerable advantage compared with the other major advanced economies. But compared to these populations, Australia will be in a class of its own. For Australia the United Nations projects that the population in this age group will increase by 25 per cent — almost three times faster than the United States rate. The United Nations projects for Australia over the next two or three decades far faster workforce growth than in any other sizeable advanced economy. Australian official population projections are even better. They are devised on different assumptions about net migration and so forth so are not directly comparable. Even so, the ABS and Treasury projections are markedly stronger than the implied UN projection of a 0.7 per cent annual average growth rate of Australia’s working-age population over coming decades. In its central forecast of Australian population growth to 2061, the ABS projects an implied average annual population growth of around 1.2 per cent through the period. It projects the number of people of workforce age, defined here as those aged 15 to 64, will increase at an implied annual average growth rate of around 1 per cent. Treasury’s 2015 Intergenerational Report Australia in 2055 projects Australia’s population will increase by an annual average of 1.3 per cent in the years to 2055 — not far below the average of 1.4 per cent of the last 40 years. In looking at the growth of the labour force Treasury comes to a quite startling conclusion, one important to Australia’s economic future. Rather than looking only at the growth of the workforce-aged cohort it looks at changing workforce participation rates. In recent decades a higher proportion of women have joined the workforce, and a higher proportion of people have remained in the workforce longer than the age cohorts they replace. Projecting forward the increasing participation rates by women and older workers, Treasury calculates a much faster rate of growth of hours worked than implied in either the UN or the ABS scenario. Its projections imply hours worked will increase at an annual average of 1.3 per cent over the next 40 years — the same rate as the population as a whole. This is nearly double the UN projection of workforce growth. The implication of Treasury’s projection is that increasing workforce participation by older people and by women can completely offset the slower rate of growth of the 15 to 59 cohort compared with the rest of the population. The population projections by the United Nations, the ABS, and Treasury all depend on a quite high rate of migration. Like other advanced economies natural population increase in Australia is now quite small. The fertility rate is below replacement rate, so the only source of natural increase is declining mortality rates or ageing. In recent decades about half the growth in population is from natural increase and half from net overseas migration. In the ABS projection net migration is assumed to be 240 000 each year. Almost all of the projected increase in the Australian population is attributable to net migration, both the migrants themselves and then also their offspring. The Intergenerational Report assumes annual average net migration of 215 000. Australian productivity growth has been reasonably good compared with other advanced economies, but not exceptionally good. From 1980 to 2015 total labour productivity increased at an annual average rate of 1.6 per cent. Across the sectors where the ABS is confident it can actually measure productivity, it increased at an annual average rate of 2.3 per cent in the 19 years from 1996 to 2015. Labour productivity growth slowed in the early years of the mining boom but has since picked up again. Over the period 2010 to 2015 labour productivity in the market sector increased at an annual average rate of 2.1 per cent. Even with modest productivity projections, Australia has the potential for relatively rapid output growth. For example, in its 2015 Intergenerational Report projections Treasury adopts an assumption of future annual average labour productivity growth of 1.5 per cent. This is around the long-term average rate of increase. Combined with its projection of a 1.3 per cent annual average increase in hours worked gives Treasury’s base case of annual average GDP growth of 2.8 per cent. This is not far below the 3.1 per cent average of the last 40 years. Treasury’s projection means that real living standards per head can increase by an annual average of 1.5 per cent. This compares with the 1.7 per cent average over the past 40 years, and the 1.4 per cent average of the past 16 years. With the right policies, Treasury implies, Australian living standards per head can rise just as much in annual average terms in the next 40 years as the past 16 years. The projection that Australian output and living standards will rise in line with productivity gains and workforce growth depends on an assumption that Australian and foreign demand for its goods and services will be sufficient to permit full employment. But this is not an unreasonable assumption. Four-fifths of Australia’s output of goods and services are consumed within Australia. Demand in the global economy is likely to continue to expand somewhat faster than Australian output, and much of this growth will be in the Asian markets growing faster than the global economy as a whole. By way of example, if China’s market for services continues to grow faster than China’s GDP, and if Australia did no better than to keep the same share of China’s market for services it has today, then Australia’s service exports to China would grow at more than twice the rate of Australian GDP. Though a little slower than the past, the growth of Australian living standards can continue to increase at least as fast as those in most of Europe, the United Kingdom, Japan, and the United States. In its latest calculations the US Congressional Budget Office adopts for the next 30 years a labour productivity projection of 1.7 per cent, higher than Treasury’s for Australia. But its projection for the annual average growth of hours worked is only 0.4 per cent, well below Treasury’s 1.3 per cent for Australia. It therefore projects US annual average GDP growth from 2016 through to 2046 at 2.1 per cent, compared with an average over the past three decades of 2.6 per cent. With population growth projected at an annual average of 0.7 per cent through to 2046, the implication is that US living standards or GDP per head will increase by an annual average of 1.4 per cent compared with 1.6 per cent over the past three decades. Even if Australia’s productivity growth is a little below the United States, even if its population growth is nearly twice as fast, the increase in its living standards per head can be a little above those now expected in the United States. It might be concluded from this Analysis that Australia has most of what it needs for a prosperous future, and that much of what it must do to secure that future it is already doing. I think that would be entirely the wrong conclusion to draw. It is true Australia has considerable strengths even in a slowing global economy. But many of Australia’s strengths are fragile, under strain, and contested. The policy requirements they impose are very far from the centre of Australia’s political debate. Most of these strengths are in Australia’s human capital, its people. But getting the most from these strengths depends on recognising what they are, valuing them, and sustaining and improving them. To offset the declining share of workforce-aged members in the population, for example, Australia will need to continue to do more to make it more attractive for women to work, for older people to keep working, and for workers displaced in one job to be retrained for another. It will need to spend more on child care, advance the pension entitlement age again, and align it with the age for accessing superannuation. All these changes at this point look politically either difficult or impossible. Australia will need to close the federal deficit to prevent debt interest chewing up more of the income of future workers. That too looks difficult. It is not at all reassuring that Australia has a large, long-running fiscal deficit in an economy which has expanded without interruption for a quarter of a century. To support a rising level of education and training Australia will need to carry through the Gonski schools program, rethink and properly resource vocational education and training, and at least maintain the commitment to university education. Productivity growth essentially depends on services sector productivity growth, since that is what most of us do. And services sector productivity growth in turn depends on the rapidity of technological innovation, on education and training, and success in building markets. All those requirements are difficult. For example, excluding tourism and education, Australia’s service exports total less than 1.5 per cent of GDP. The opportunity may be there, the hype is certainly there, but Australian business has a very long way to go in successfully exporting services beyond education and tourism. Compared with other advanced economies, Australia’s workforce growth can be its greatest strength. The realisation of that advantage depends completely on sustaining a skills-based migration program of at least the same size as recent years. As global competition for skilled migrants increases, Australia’s migration program will have to move from passive acceptance of applications to active recruitment. In the United Kingdom and the United States voters have expressed growing opposition to much smaller immigration than Australia has accepted in recent decades. Sustaining political support for high levels of migration will depend on maintaining a reasonably fair distribution of the gains of prosperity. With increasing disparity in wealth and to a much lesser extent in income, a fair society will be harder to maintain. Thanks to Lowy Institute colleagues Leon Berkelmans, Anthony Bubalo, Michael Fullilove, Stephen Grenville, and also one anonymous reviewer for helpful comments and criticisms of earlier versions. Thanks too to Lowy’s Lydia Papandrea for a highly professional edit. Lawrence H Summers, “The Age of Secular Stagnation: What It Is and What to Do About It”, Foreign Affairs, March/April 2016, https://www.foreignaffairs.com/articles/united-states/2016-02-15/age-sec.... See also Coen Teulings and Richard Baldwin eds, Secular Stagnation: Facts, Causes, and Cures (London: CEPR Press, 2014). In “Investment Hollowing Out”, a paper prepared for the Seventeenth Jacques Polak Annual Research Conference at the IMF in November 2016, Lewis Alexander and Janice Eberly identify a fall in US investment relative to fundamentals, but one that began at the turn of the millennium: see http://www.imf.org/external/np/res/seminars/2016/arc/pdf/Alexander_Eberl.... Robert Hall identifies a lingering impact from the halving of business equipment investment immediately after the 2008 financial crisis: see Robert Hall, “The Anatomy of Stagnation in the Modern Economy”, Phillips Lecture, London School of Economics, 28 April 2016. Robert Gordon, The Rise and Fall of American Growth: The US Standard of Living since the Civil War (Princeton, New Jersey: Princeton University Press, 2016). Economists Gregory Clark, Benjamin Friedman and others discuss Gordon’s book, with a response by Gordon himself, in “Critiquing Robert J Gordon’s The Rise and Fall of American Growth”, The American Economic Review 106, No 5 (2016), 52–76. Asian Development Bank, “Part 2: Asia’s Potential Growth”, in Asian Development Outlook March 2016 (Metro Manila, Philippines: ADB, 2016). See, for example, Rowan Callick, “Great Fall of China on Cards Say Economists”, The Australian, 23 July 2016. Thomas Piketty, Capital in the Twenty-First Century, translated by Arthur Goldhammer (Cambridge, Massachusetts: Harvard University Press, 2014); Branko Milanovic, Global Inequality: A New Approach for the Age of Globalization (Cambridge, Massachusetts: Harvard University Press, 2016). Alvin Hansen, “Economic Progress and Declining Population Growth”, The American Economic Review 29, No 1 (1939), 1–15. About half of one per cent of the decline was in manufacturing. As a share of GDP investment in service industries does not seem to have changed much. Total gross fixed capital formation is also down 4 per cent of GDP from its 2012 peak. Public investment fell by around 1 per cent of GDP and residential investment rose by around half of one per cent. All these are volume numbers. Savings have come down by much the same share of GDP over much the same period, using nominal data. Non-residential private fixed investment declined a little in the first two quarters of 2016, after a reasonable four-year upswing. Using World Bank tables of gross saving to GDP. It has been 18 per cent of GDP for the past four years. On World Bank numbers: http://data.worldbank.org. Residential investment in the United States was 4.8 per cent of GDP in 2000 and rose to 6.6 per cent in 2006. By 2010 it had fallen to 2.5 per cent of GDP. It then began to recover but even in the first quarter of 2016 it was still only 3.6 per cent of GDP — three percentage points below the share it had reached ten years earlier. Private gross fixed capital formation in the United States averaged 18.6 per cent of GDP in the eight years from 2000 to 2007 and has averaged 15.6 per cent in the years since 2010. The three percentage point decline pretty well matches the decline in residential investment. US gross capital formation overall has been rising over the past few years. It hit bottom at 18 per cent of GDP in 2009, and has been 20 per cent of GDP in 2013, 2014, and 2015. These data do not conclusively reject Summers’ argument, which depends on intended saving and investment rather than actual saving and investment. Intended saving and intended investment are unobservable. But if business investment is much the same as a share of GDP in recent years as it was before the global financial crisis, if saving is a little less, if output growth is on average not much slower, then it is difficult to see evidence of secular stagnation. Summers may well argue that US monetary policy is now ineffective in stimulating faster growth and that more government spending would help, but that is not a new theme. Australian Bureau of Statistics, “ABS 5260.0.55.002 — Estimates of Industry Multifactor Productivity, 2014–15”, Table 9. Australian Bureau of Statistics, “6227.0 — Education and Work, Australia, May 2015”, http://www.abs.gov.au/ausstats/abs@.nsf/mf/6227.0/. Matt Wade, “Australia’s Knowledge Revolution Goes Unnoticed”, The Sydney Morning Herald, 18 September 2016, reporting on The Herald–Lateral Economics Index of Australia’s Wellbeing, a human capital index prepared and authored by Dr Nicholas Gruen. This is the ABS ‘selected industries’ measure, using quality adjusted hours worked. It is also 1.8 per cent across the economy as a whole. The unadjusted average for selected industries was 2.3 per cent. I am grateful to Dr Greg Connolly, Director of the Labour Economics Section in the Economics Branch of the Department of Employment for these data. That said, it also needs to be recognised that we do not know as much about service sector productivity as we need to know. In some of the biggest areas, notably health and education, there are currently no good measures of productivity because without market prices it is harder to measure output. In financial services, output measures and thus productivity are influenced by a very rough and approximate measure of the core product in banking. Parliamentary Budget Office, “National Fiscal Outlook as at 2015–16 Mid-year Fiscal Updates”, Report No 01/2016, February 2016.
 International Monetary Fund, Fiscal Monitor: Acting Now, Acting Together (Washington DC: IMF Publications Services, April 2016). It may be that both taxes and spending continue to increase as shares of GDP, but this may not affect household income in the same way as debt reduction. If the expanding areas of government spending are health, education, and social security, the tax increase will be offset by payments to households either in cash or in services that would otherwise have to be purchased out of household income. Income is being redistributed through government, but not reduced. US Census Bureau, “Income, Poverty and Health Insurance Coverage in the United States: 2015”, Release Number CB16-158, 13 September 2016, http://www.census.gov/newsroom/press-releases/2016/cb16-158.html. Australian Bureau of Statistics, “6523.0 — Household Income and Wealth, Australia, 2013–14”. Looking at percentiles, the story is much the same, but more compressed. The incomes at the top of the ninetieth percentile gained 66 per cent, those on the tenth percentile, 54 per cent. OECD, Income Distribution and Poverty, OECD.Stat, https://stats.oecd.org/Index.aspx?DataSetCode=IDD. What of the frequent claim that Australian living standards have fallen in recent years? The measure known as real net national disposable income per head takes the normal measure of gross domestic product and deducts capital depreciation and net income payments abroad. It then adjusts for changes in the terms of trade or the ratio of export prices to import prices. It does this by deflating the value of exports by the import price deflator rather than the export price deflator. When export prices fall and import prices rise, as has been the case in recent years, this method reduces the apparent volume of exports compared with the volume that would result from using the change in export prices. Since exports are part of GDP, it thereby reduces apparent GDP compared with the usual measure. Effectively, this method values exports in terms of the imports those exports could buy. On this measure, Australian real income per head fell 6 per cent from the third quarter of 2011 to the first quarter of 2016. That might suggest Australia has joined other advanced economies in experiencing declining living standards. But other, more accurate, measures produce quite different results. From the first quarter of 2011 to the first quarter of 2016, the same period over which the terms of trade income per head measure fell 6 per cent, the usual measure of GDP per head increased by 5 per cent. Household gross disposable income per head deflated by the consumer price index rose by 3 per cent over the period. Wage and salary incomes deflated by the ABS cost of living index for employee households rose 10 per cent over the period. Per hour worked, average real wage, and salary income rose 4 per cent. I doubt the terms of trade adjusted measure of real income truly reflects changes in Australian living standards. It depends on what actually happens to export income, and consumer choices between imports and other domestically produced goods and services. Other economies subject to big terms of trade changes such as China, Japan, and Canada do not make the same fuss over the measure. In any case, the discussion in other advanced economies is about the past three or four decades, not the past three or four years, and not because of the change in export prices compared with import prices. Even using the real net national disposable income (RNNDI) measure, Australian real incomes per head have increased by two-thirds over the past 25 years. Moody’s Global Credit Research, “China Credit: Authorities Have Tools to Avert Financial Crisis, but Erosion of Credit Quality Likely”, 26 May 2016. At 65 per cent of GDP, Chinese government debt would then be of the order of US$7.15 trillion at current exchange rates. By comparison, China’s official offshore assets or foreign exchange reserves are now around US$3.2 trillion. Wojciech Maliszewski et al, “Resolving China’s Corporate Debt Problem”, IMF Working Paper No 16/203, October 2016.
 International Monetary Fund, World Economic Outlook, April 2016 database; constant price GDP. It is true that because of their faster growth the increasing weight of the emerging economies lessens the impact of the slowing of that growth on total world output growth — but not enough to completely offset the slowdown. This is apparent from looking at the advanced economies. They slowed by 1.3 percentage points. If over the same period their total weight in the world economy remained the same (instead of declining, as it did) this would have accounted for 0.55 percentage points of the total global slowdown between the two periods 2005–2007 and 2013–2015 of 2 percentage points. The emerging economies accounted for the remainder of the slowdown, with their increasing weight in the global economy offsetting some of the impact of their slowdown. From 1999 to 2006 US productivity increased at an annual average of 2.4 per cent. In the three years 2013–2015 it increased by an average of a little less than 0.4 per cent. In the United States and the United Kingdom (and more recently in the euro area) the impact of the decline in productivity growth on GDP growth has been offset by faster employment growth. The number of hours worked in the three years 2013–2015 increased much faster than it had in 1999–2006. Bank for International Settlements, 86th Annual Report, 1 April 2015–31 March 2016 (Basel: BIS, June 2016). Noriko Tsuya, “The Impacts of Population Decline in Japan: Demographic Prospects and Policy Implications”, Suntory Foundation Research Project, Forum 005 Special Report. The working-age population is aged between 15 and 64. These OECD projections look conservative. Using IMF figuring based on purchasing power parity exchange rates, global growth was 3.4 per cent in 2014 and 3.1 per cent in 2015, well under the average of 3.6 per cent projected by the OECD for coming decades. UN Department of Economic and Social Affairs, Population Division, World Population Prospects: The 2015 Revision, Key Findings and Advance Tables, Working Paper No ESA/P/WP.241, 2015. Because the number of people older than 64 will continue to rapidly increase, the working-age share of the population will fall from 67 per cent in 2012 to 60 per cent in 2061. The ‘market sector’ or in recent times ‘selected industries’. Defined as GDP per head. I ignore movement in the terms of trade since: (1) they will likely move up and down over the coming 40 years as they have in the past 40 years; and (2) I distrust the RNNDI methodology, for the reasons mentioned earlier. The projection also depends on an assumption that labour productivity growth in future can match the average rate of the past three or four decades. This is more speculative, but again not unreasonable. If workers’ skills are increasing we ought to expect increasing output per hour worked, at least in the kind of flexible, open, and services-based economy that Australia now has. If capital per worker is increasing, then we also ought to expect increased output per hour worked. Both of these are true in Australia. We have seen that the level of education and training in the workforce is continuing to increase. Capital per worker has also increased, quite dramatically. Over the ten years to 2014/15 Australia’s net capital stock increased by 47 per cent, while the number of hours worked increased by only 16 per cent. For the net capital stock to continue to increase faster than hours worked, Australia needs total investment as a share of GDP to exceed 17.3 per cent. In recent years it has been higher than 25 per cent, and in the longer term (excluding the mining investment boom phase) it has averaged around 19 per cent of GDP. The calculation is as follows. On Treasury’s forecast the number of hours worked henceforth will increase on average by 1.3 per cent a year. The volume of Australia’s capital stock is now 3.2 annual GDP and it depreciates (consumption of fixed capital) by around 5 per cent a year. That means Australia requires an annual investment rate of 16 per cent of GDP to maintain its existing capital stock (since investment is the addition to capital stock). To continue increasing the capital stock faster than the increase in the labour force (or in this case hours worked), investment would have to be at least 16 per cent of GDP, plus 1.3 per cent of GDP to match the growth of hours worked. That is, China’s market for services grows at 6 per cent and Australia’s GDP grows at 2.8 per cent — not unreasonable projections. Congressional Budget Office, “The 2016 Long Term Budget Outlook”, July 2016, https://www.cbo.gov/publication/51580.